European leaders have reacted with alarm to Turkey's purges following the weekend's failed coup attempt. European leaders caution that the rule of law must be respected as the number detained exceeds 9,000. European leaders said Monday that Turkey's widespread crackdowns on police, the judiciary and the military are increasingly alarming and threaten stability and EU-Turkey relations. "We are the ones saying today rule of law has to be protected in the country," the EU's foreign policy chief Federica Mogherini said in Brussels. "There is no excuse for any steps that take the country away from that." President Recep Tayyip Erdogan has doubled down with vows that the "cleansing" of state institutions will continue as around 9,000 people were arrested, and the military announced the formal end of the failed coup. In Germany, Norbert Röttgen, Christian Democratic Union (CDU) member and chair of the foreign relations committee of the Bundestag, says there is evidence that Erdogan is using the coup to make a power play to further exclude oppositional political forces. "This is to say that President Erdogan would use this coup to consolidate his power mostly by eliminating constraints and the opposition," Röttgen said in an interview with the German newspaper Die Welt. Senior figures within the center-right CDU - the party of Chancellor Angela Merkel - have become increasingly skeptical of Erdogan and question Ankara's reliability as a diplomatic and security partner. Rumblings are also being heard within the CDU's coalition partner, the center-left Social Democratic Party (SPD). Erdogan's talk of restoring capital punishment is also alarming diplomats in other European capitals. "In a democracy, you cannot ignore the demands of people," Erdogan said Sunday evening, citing chants from supporters calling for the death penalty, which was formally abolished in 2004. That would be unacceptable, Austrian Foreign Minister Sebastian Kurz, a frequent Erdogan critic in Europe, told Austrian newspaper Kurier. "The introduction of the death penalty would of course be absolutely unacceptable," Kurz said in remarks published Monday. "There must be no arbitrary purges, no criminal sanctions outside the framework of the rule of law and the justice system." Restoring the death penalty would almost certainly scuttle Turkey's halting bid for EU accession, which was reactivated as part of a comprehensive deal for Turkey to contain mass migration from Syria, Iraq and elsewhere to the EU. Turkey has blamed the attempted coup on loyalists tied to US-based Islamic cleric Fethullah Gulen, who has lived in self-imposed exile since 1999. Ankara has repeated demands that the US extradite Gulen but to date has not offered formal evidence of criminal wrongdoing. Some EU leaders are worried that Turkey could be using the unrest to settle old scores against Gulen, a former ally turned rival of Erdogan. Johannes Hahn, the EU commissioner dealing with Turkey's membership bid, said that given the wide-ranging types of people under suspicion, a comprehensive dossier could only have been drawn up in advance. "It looks at least as if something has been prepared," Hahn said Monday. "The lists are available, which indicates it was prepared and to be used at a certain stage." 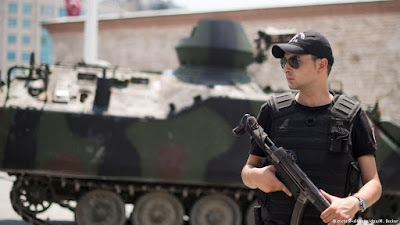 Meanwhile in Istanbul, police commandos raided the prestigious air force military academy in search of new suspects, the state-run Anadolu news agency reported. 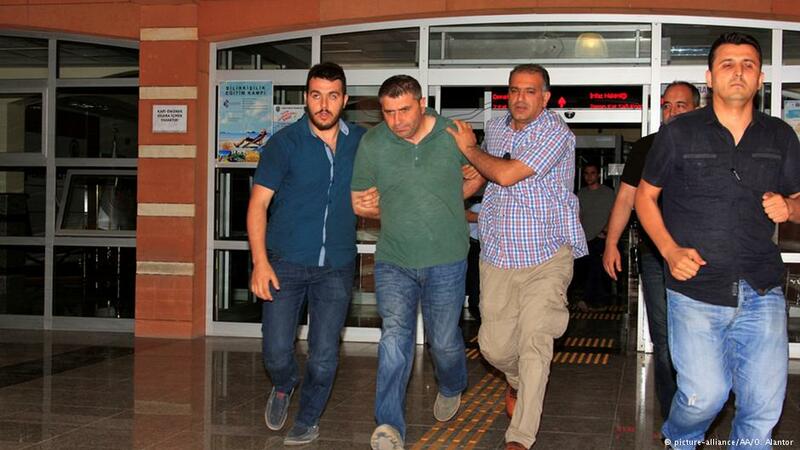 Authorities have also detained General Mehmet Disli, who conducted the operation to capture Turkey's chief of staff Hulusi Akar during the stand-off. Reports had said that a total of 36 generals had been detained so far. The private Turkish Dogan news agency reported Monday that 10 of them had now been remanded in custody by the courts. The Turkish president has urged citizens to remain on the streets even after the defeat of the coup, in what the authorities describe as a "vigil" for democracy but witnesses describe as gatherings mainly made up of supporters of the ruling Justice and Development Party (AKP) co-founded by Erdogan.